Sometimes watering your lawn can be difficult to do consistently. Following a water schedule and knowing when to deviate from that schedule is not an exact science. You can never predict how much rain you will actually receive when you have storms or heavy rain and flooding. The solution is utilizing a sprinkler system to do the work for you. 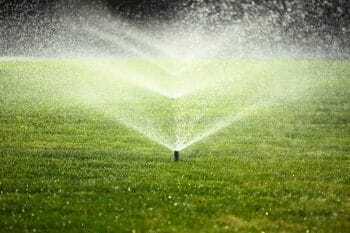 What does an automatic sprinkler system cost? Location of a water-supply shutoff valve. To connect my irrigation system to my home’s water system is a licensed plumber required? How deep should I dig? Most building codes require you to dig down to a certain depth. DYI or Professionally installed. Should you install the automatic sprinkler system yourself or let the pros do the work for you? Digging trenches is not fun, but there are machines that can dig trenches for you. How Much For a Sprinkler System? A professionally installed system for a typical quarter acre lot is roughly $2,000 to $4,000. You can also do it yourself (DIY) for under well $1,000. If you want dig the trenches yourself. The question is do you want to save time, or save money installing the automatic sprinkler system? A popular option for the DIY enthusiast is the Rain Bird Automatic Sprinkler System. It’s relatively easy to install and makes a good DIY project, and you will also save money. Compared to 10 years ago, today’s automatic sprinklers systems quite advanced. The past sprinkler systems used dials to set timers. Now it is easier than ever with smart system controllers like the Rochio Smart Watering System. Automated features decide when it’s been raining too much or too little, then adjust the amount of water your landscaping gets. This makes the whole watering system nearly maintenance free. Work That You Can Dig! Digging or trenching channels in your yard for the water supply lines and sprinkler heads is your next step for DIY. Mark out the locations of the irrigation lines using string lines, powdered chalk, or lawn marking paint. Most building codes require you to dig down 18 inches to protect the water lines from freezing. Colder climates might require more depth. Be sure to check you local building codes in the town or area you reside. Knowing about any other build codes for sprinkler systems will save time and prevent you from having to rework the system because it is not up to code. DIY installers might require you to have a plumber and or electrician sign off or installer the plumbing and electrical work completed. The cost for that should be considered. the cost for an electrician can run about $90-$110 per hour to extend a circuit to the automatic timer. Having a plumber to tap into your household water system will range into about $200-$300. This is strong reason to have a professional that installs Lawn Irrigation Systems do the work for you. Bad plumbing or faulty electrical can not only be costly, but also dangerous.